It’s time to do some deeper analysis of the most intricate part of the model – the former palace and now museum. This is the section of the model built in the French Renaissance style which opened as a museum in 1793 with later remodels and additions. The style is a precursor to the intensely decorated Baroque style that swept over Europe. This creates a challenge for the designers of this LEGO model, since it is difficult to capture these ornate details in such a small scale. 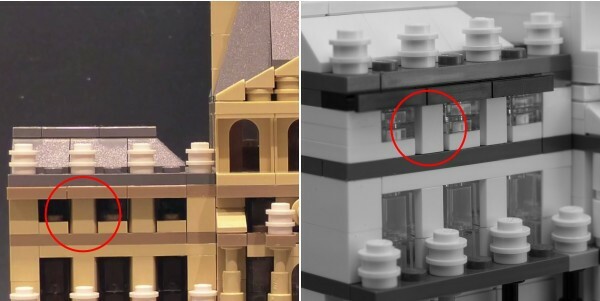 As you will see, they employed some uncommon parts usage and other tricks to pack a lot of detail into a small model, much like the 2014 LEGO Architecture set featuring the Trevi Fountain. Clever use of telescope for columns, and 1x2x2 panel with arch. The Telescope is well used, although it is only 1 2/3 brick tall so it is placed on a 1×1 round plate to match the height of the panels/arches. Wait, there’s no such thing as a 1x2x2 Panel with an arch! I’ve since learned that this is a part which has existed since 2012, Window 1 x 2 x 2 Castle (90195) Oops, it was new to me… This is the only explanation, and I’m extremely confident that this new piece is real after seeing additional photos from other angles (Especially after seeing this video from promobricks.de). I find it a bit odd that the edge of the panel doesn’t appear to be covered with a tile or other thin component. (The video reveals some odd shadows in the leftmost arch, indicative of this gap. 1×2 Log Bricks give a subtle extra spacing around the upstairs windows. Another surprise exists upstairs. We see a strange gap between the windows and the bricks in between them. It looked a lot like the end of a 1×2 Log Brick (Palisade), and upon experimentation it achieved the same look as in the photo so I think it’s a correct match. A strange subtle detail, indeed. Nothing too tricky up top, although I had to make some subtitutions as I don’t have the appropriate 3-brick tall slopes without disassembling my Haunted House. 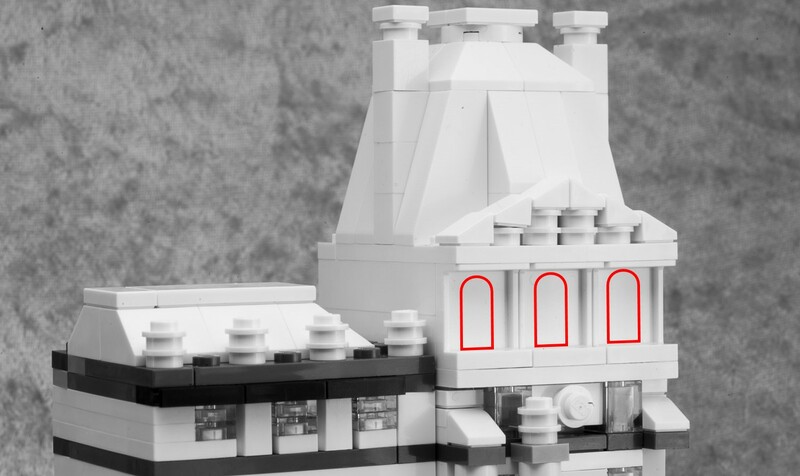 You see the back side of the new panel with arch, which I’ve annotated to show where the arch would appear. 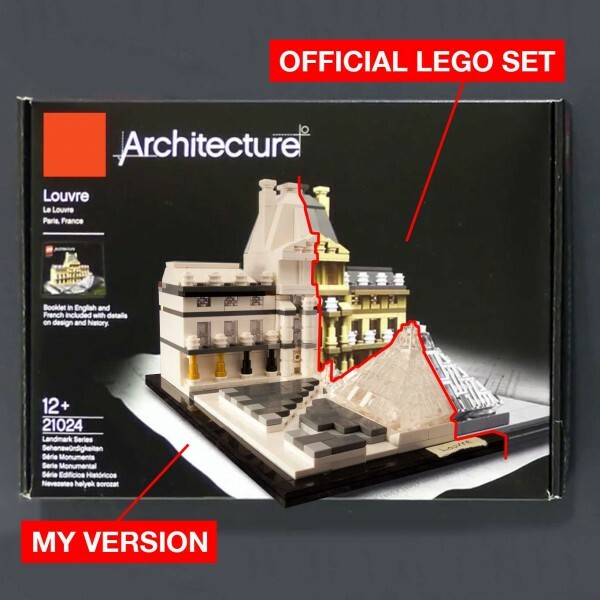 While every LEGO architecture set is an insta-buy for me (I have every model in the series), this is the 2015 set that I am most excited about. 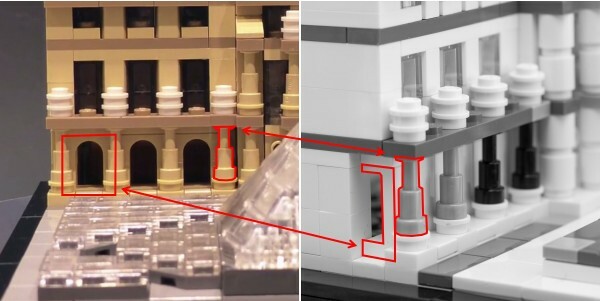 I love the challenge of capturing a more ornate Architectural style using LEGO bricks, and the result is excellent. The model is immediately recognizable, and it explores a building that is both iconic and captures two different eras in a single composition. 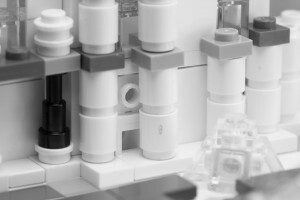 I think the part selection will be interesting, and it’s neat to see a whole new part showing up in the Architecture series first. I didn’t have enough parts to build both sides of the model, so I superimposed my re-creation on top of the official box photo. My initial review is 8/10, putting this on par with the excellent Trevi Fountain, and Eiffel Tower; just below my two favorite mid-priced sets: UN Headquarters and The White House. I look forward to receiving the final set to see if it lives up to my expectations, and to see where I made mistakes in guessing about the construction of this model. NEW COLOR – 16x, Tan Minifig Telescope (64644) – Tan is a new color for this part. 6x, Trans-clear Tile 1×1 (3070) – This is a rare 0.30$ part. 38x, Trans-clear Tile 1×2 (3069) – This is a rare 0.20$ part. What did you think of this (pre)review? Do you want to buy the set when it arrives in stores? Are you excited about the model or the detaisl of it’s construction? Next story “The LEGO Architect” – a preview of my upcoming book! Very good job ! As usual. The review was great! We haven’t purchased any of the Architecture sets, but when they announced this one I wanted to buy it immediately. Hopefully my husband will buy it as a birthday present for me… with a Trevi Fountain in the bag, too (my next favorite Architecture set)!